Ravi Zacharias of Ravi Zacharias International Ministries is being called upon by the public to respond to allegations of manufacturing his theological and academic qualifications. 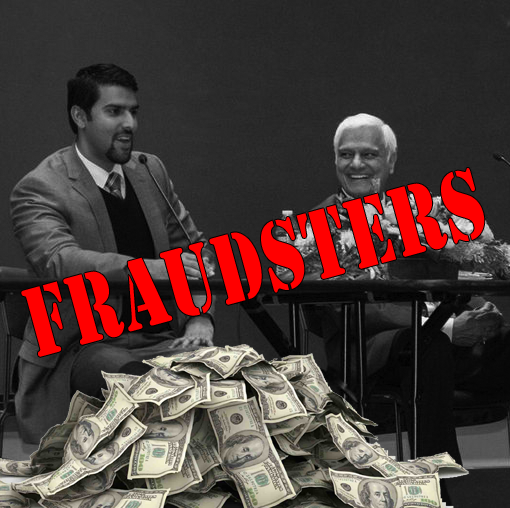 Touted as a “Dr” who is alleged to be a visiting scholar at Cambridge University, UK, Ravi Zacharias is facing claims of being a fraudster. Popular YouTuber FriendlyBanjo attempted to verify the academic qualifications of Mr. Zacharias and found them to be absolutely false. In a damning video, showing clear manipulation of academic credentials and falsifying biographical details, the inter-faith community is calling on Mr. Zacharias to tender his resignation, and return monies stolen under false pretenses. Mr. Zacharias is the founder of an international evangelical ministry which attempts to spread the “Gospel” worldwide, specifically targeting Atheists and Muslims. An acclaimed author and international speaker, Mr. Zacharias is now being labeled as an Ergun Caner 2.0, a complete and total fraudster who attempted to pass of honorary degrees as having been academically qualified. Questions are now also being asked about monies collected under these false pretenses, which are said to have been used in the publication and promotion of the Qadiani Nabeel Qureishi’s latest publication, “Seeking Allah, Finding Jesus”. Written in a similar style to Ravi Zacharias’s biography, as well as funded and promoted by Ravi’s Ministry, many are now asking if Nabeel’s biography also contains similar embellishments as have now been indicated in his mentor’s manufactured biography. As pictured above, Nabeel closely works with Ravi and is featured heavily in RZIM’s Toronto tour on September 12th of this year. Many faithful believers assumed that Mr. Ravi’s theological and academic qualifications were accurate given his popularity in evangelical circles, today that assumption is causing many to regret donating thousands of dollars to a fraudster on par with internationally condemned Ergun Caner who also falsified academic and theological qualifications, as well as having been accused of manufacturing his biography in exchange for monies, academic positions and paid speaking engagements. Wallahi I knew something was wrong about this guy ..subhanallah !! this is genuinely shocking. Well done to Ijaz for making it more widely known..
“Dr. Ravi Zacharias never got a PhD” – He never claimed to have gotten one. He has received honorary doctorates from respected accredited universities – “not Bible buddies.” He faults RZIM for not saying that they are honorary. However, if you google the titles and where he received them, you will notice that those institutions do not offer those degrees and often those titles like Doctor of Laws and a Doctor of Sacred Theology are honorary degrees. He never claimed to have earned these degrees. “In fact he never even got an academic advanced degree, but a pastoral degree.” No, not a specialized one, but one that is more rigorous than many specialized MAs. Trinity Evangelical Divinity School of Trinity International University is a very rigorous institution with many students going on to PhDs straight out of the Mdiv program. It contains practical classes, but those classes only take up a portion of the overall program. And Ravi majored in Philosophy of Religion and was supervised by scholars with their PhDs in Philosophy from respected secular universities. Check out the current MDiv program for yourself in the Appendix (which is similar to what Ravi did at the time). Ravi had to study Hebrew, Greek, Scripture, history, theology, and philosophy of religion. He received a rigorous education. When in the town of Cambridge, he was supervised by Dr. Jeremy Begbie, B.A. (University of Edinburgh), B.D. (University of Aberdeen), Ph.D. (University of Aberdeen), A.R.C.M., L.R.A.M, F.R.S.C.M, who has acknowledged this. At the time, Dr. Jeremy Begbie held a joint appointment at Ridley Hall and Cambridge University itself. Ravi Zacharias took a scholarly leave to study at the time and was visiting to study under Dr. Jeremy Begbie. Therefore, although not precise, he did take scholarly classes at Cambridge and was supervised by a Cambridge scholar Dr. Jeremy Begbie. In that sense he was a visiting scholar, doing his own research. Since then, RZIM has made this more precise. Do you think that Nabeel has embellishments in his biography? What is your evidence for this? An additional 18 hours in the Philosophy of Religion (In Ravi Zacharias’ case). Thanks for the response Nick, but this does not help his case. His ministry, which carries his name and which advertises him as a Dr. in all promotional material, refers to him with this academic title. Either he has for several years been completely unaware of what his ministry does, and should thus resign for such poor management, or given his active participation in the organization, he allowed this perception to build and did not correct it until questioned. If Ravi did an MDiv, then he is not a Dr. He does not have a PhD. I think that is clear. Now that you agree that he does not have this qualification, on what grounds do you justify his usage of a title which carries absolutely no academic merit, but which is found in his personal biography, in his videos, all promotional materials, etc? How can that be justified? It cannot. This was intentional, unless he was not in control of his mental faculties and was unaware that by using this title, it would carry the connotation that he did possess a PhD. Given the information you have provided, he was not a visiting scholar at Cambridge. That’s like claiming you attended a seminar by lecturers at UoT and somehow that made you a visiting scholar at UoT. It is laughable. I know that you are a person of great intelligence, so to see you using these excuses is quite below your stature. There is nothing wrong in conceding that Ravi has made a mistake and that he needs to own up to it, to take responsibility for the mess he has caused. He is human, Nick. Human like you and I, with human flaws. Can’t you accept that he honestly erred and that he needs to clear his name now? I am a full professor at a law school (i.e., an academic). The vast majority of lawyers do not have a Ph.D., yet there are times when I am called “Doctor” by someone. For these short conversations I never correct them–it seems out of place. I think this addresses your concern that Ravi has been called “Doctor” by others in public settings. Second, there are people that use the word “doctor” for honorary degrees. Not something I would do, but I recognize that it is not that uncommon. Third, when I saw the degrees that he listed on his website I immediately recognized them as honorary degrees. I see no reason to list the obviousness nature of the degrees–he was not hiding anything. By the way, it is a great honor to receive one of these degrees. He has six. Fourth, when you go to the Ridley website it is unclear what their affiliation is with Cambridge University. The British University system is quite different from our own, so it is possible that Ravi was unaware of the loose affiliation Ridley now has with Cambridge University. So it comes down to this. Do we impute ill motive to Ravi or do we use the same grace we extend to ourselves when we are misunderstood by others. From what I understand, as soon as any question was raised about his credentials he quickly clarified them on his website. That demonstrates he is operating in good faith. Why not also assume that his prior representations were also made in good faith. When I have encountered charlatans, there have been no half measures. They completely lied. That is not the case here. So given the circumstances I would err on the side of an innocent representation rather than assuming this is scandalous. Proponents of Islam (which this site is all about) would do ANYTHING to silence the Truth of the book, “Seeking Allah, Finding Jesus.” Look at the source of this attempt to defame Ravi’s character. If Ravi has an ego problem, and that is the worst thing that can be said about him, I would wish to be more like him since my sins are far greater. Others with national acclaim generally practice the same sin but are given a “pass,” which is fine with the public until those with the egos say something that the public doesn’t want to hear. Ravi is only human. So was Mohammed. Having known Nabeel and interacting with him, it’s not about doing “anything”, but merely holding folks responsible for their claims and actions. That’s all it is. I openly don’t believe in Christianity, but that does not mean my actions are based on malintent, it merely means I believe that I don’t have any convincing reason to accept Christianity and so my critiques and criticism are from this point of view. We are all human, but if you’re doing to put Ravi on a pedestal, you may want to know more about him before doing so.